Typhoons, cyclones, and hurricanes are tropical storms. They are basically the same, just called by a different name in different parts of the world. Over the western Atlantic Ocean and the eastern Pacific Ocean they are referred to as hurricanes. Over the western Pacific Ocean (Asia) they are called typhoons, and the same type of tropical storm over the Indian Ocean is a cyclone. The difference between a tropical depression, a tropical storm, and a hurricane is wind speed and intensity of the storm. The Saffir-Simpson Scale is used to measure the strength of major tropical storms such as hurricanes. And placing them into categories of strength based on a scale of 1-5. Typically starting as a normal thunderstorm, the proper conditions can develop these storms into intense weather disturbances. If a group of thunderstorms combine together for a certain period of time under the right conditions in the atmosphere they develop into a tropical depression. There will be constant wind speeds near the center between between 20 and 34 knots (23 - 39 mph). These storms turn into a tropical storm if it has wind speeds of 39-73 mph (62-117 km/hr). These extremely large and powerful weather patterns are tropical storms characterized by a low pressure storm center and many combined thunderstorms that create potent winds and often intense rain that results in flooding and storm surges along coastlines. Condensation of water vapor which is held in the moist air, is the result of the heat released when wet air rises, and this basically feeds the storm, making it bigger and more intense. The area just northeast of the Philippines is the most active place in the world for tropical typhoons to exist. The northern Luzon and the eastern Visayas areas in the Philippines are the most often affected parts of the country by these storms. Tropical storm activity across the archipelago is the most active during the months of July through October, with the most active period in September. By November, storm occurrences drop, with the minimum active period being February. Dissimilar to tornadoes, typhoons and hurricanes do not form suddenly with no notice. 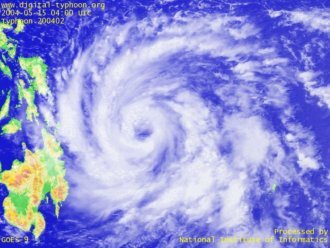 Nowadays, it is quite easy to spot and observe the path of typhoons thanks to modern satellites and communication systems. It can take many days before a minor storm turns into a tremendous hurricane. Consequently, weather forecasters have the ability to inform everyone well in advance that a storm is approaching.